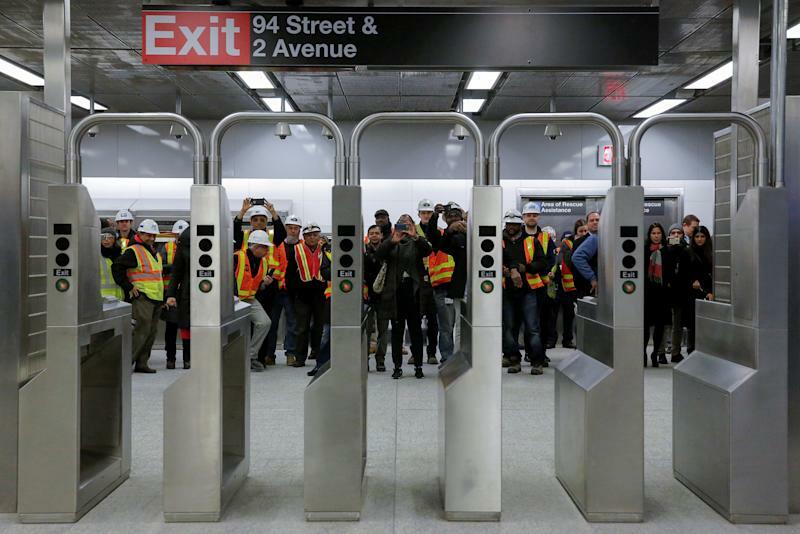 Workers take photos through the turnstyles at the 96th Street Station during a preview event for the Second Avenue subway line in Manhattan, New York City, U.S.
NEW YORK (Reuters) - While more than a million people party in Times Square, a select group of construction workers, business leaders and New York officials will toast the new year underground with an inaugural ride on a subway line that has been a century in the making. First proposed in the 1920s, the Second Avenue line has achieved near-mythic status over the years as the best transit idea that New York never built. Work started and stopped three times for lack of funds before the project finally got under way in earnest in April 2007. 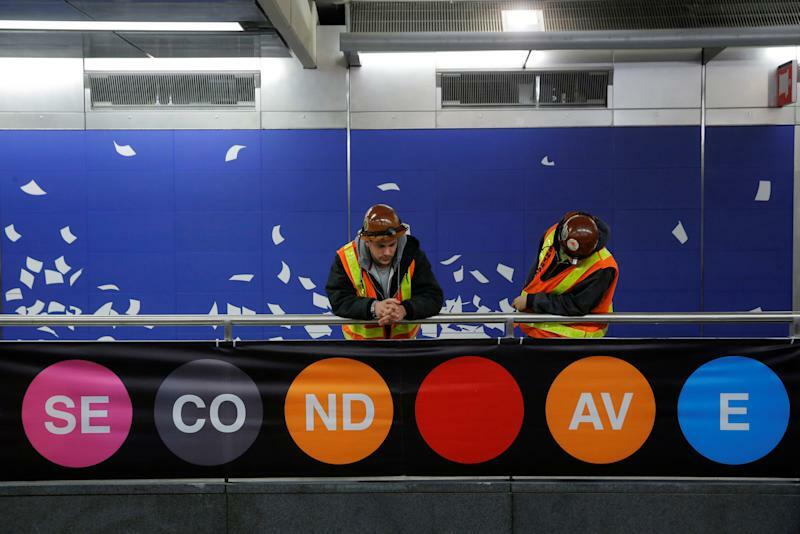 New York Governor Andrew Cuomo and Thomas Prendergast, chairman of the Metropolitan Transportation Authority, the agency that operates the subway system, are presiding over the ceremonial opening of the first phase, a modest two-mile (3.2-km) stretch along Manhattan's Upper East Side. The launch party, which is by invitation only, will take place about 100 feet below street level starting around 10 p.m. on Saturday (0300 GMT on Sunday). The general public can begin riding to and from any of three new stations at noon Sunday. Eventually the line will run 8.5 miles (13.7 km) from the uptown's Harlem district to Wall Street in lower Manhattan, if current plans ever come to fruition. Compared with the entire subway system, the country's largest, the new service is not extensive. Even so, for residents of the relatively isolated East Side, the opening comes as a welcome and long-anticipated relief. Cuomo, an ambitious Democrat who has been mentioned as a possible presidential candidate, has taken on a visible role in pushing the subway project along. The governor, now in his second term of office, has made an emphasis on big construction projects, including a replacement of the Tappan Zee Bridge across the Hudson River north of New York City and major renovations at LaGuardia Airport. The opening of the subway extension coincides with the incoming administration of President-elect Donald Trump, who has pledged to jump-start infrastructure projects through tax credits. Cuomo has spoken with pride of art, including 12 portraits by painter and photographer Chuck Close, that graces the walls of phase one's three new stations at 72nd Street, 86th Street and 96th Street. "Even if a child never walks into a museum ... they should be exposed to art that gives them that aspect, that perspective and that creativity," Cuomo said on NBC's "Today" show on Friday. But the art is among a host of special features that have added to the $4.5-billion cost of the first phase. The stations boast high ceilings and wide platforms without support columns, among other amenities. The new line is the second major expansion of the system, which started in 1904, in as many years. 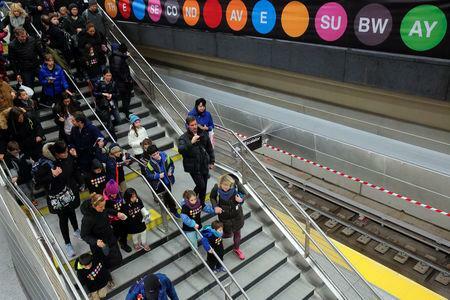 In September 2015, the MTA christened a one-mile (1.6 km) extension of the 7 line from its former terminus in Times Square to Hudson Yards, on Manhattan's long-neglected Far West Side. The cost was $2.4 billion.